Hey, Baby – Wanna Facilitate Some Mixity? ANALYSIS: a territorial and social fragmentation, a typical “no-man’s land” undergoing the urban exodus, the settlement of the old and inactive persons, the absence of public place in the body scale substituted by the car. PROBLEMATIC: How to attract a new living to facilitate the social and urban mixity? Philanthropy may be an especially bad place for phony elitism — but obviously we’re not alone. From the sound of that quote, we may not even be the worst. 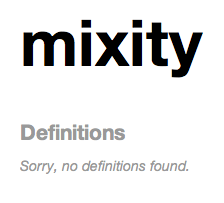 Quick, everybody: Where’s the first place we can work “mixity” into a foundation report?